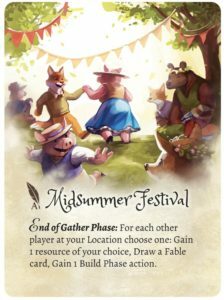 Druid City Games is giving away new promos for their delightful game, The Grimm Forest, at Gen Con! But James didn’t forget GenCanters and has provided two sets of these promos for you to win! All you have to do is comment on this post, and two lucky winners will be drawn at random on Sunday August 5. Thank you Druid City Games! This is my favorite game!!! I would love these promos. Yes please! These promos would be awesome! Spoiler alert. I just found the hidden promo inside my game box so I’d love to add these to it! Love this game! Sooo pretty is right! The art is gorgeous. Thank you Druid City Games! Got my figures fully painted on to the table and everybody had a blast. Would love to add these cards to my game! Thanks for all the fun. GenCan’t has been a blast! Grimm Forest is such a good game, and it’s super pretty on top of it, thanks for the chance to win these Druid City! If it’s Grimm. I’m in! Enjoying Gen Can’t with two of my best friends. Thanks to all who organize this! Love Grimm Forest and would love to have this promo. Gen Can’t is the best! This is my first GenCant year and so far it’s been fantastic! Thanks Suzanne for all your hard work and thanks to all the contributors, too! One of my favorite recent games! I would love to get my hands on these promos! This would be an awesome add on to a beautiful game! The production value on this game blew me away, and our group loves it. Game plays at the perfect length to get it to the table repeatedly! I’m going to have to take a closer look at the game box apparently…. hmmmm. Thanks for all of the effort and great stuff! Would be a great addition to my game! New to board games and I love what a wonderful community it is and gencant.com really is great. The Grimm Forest is very much on my radar to buy when I have the money, it looks like a beautiful game. Loving this game, count me in! Are there midsummer murders at the midsummer festival? A reference only people in the UK will get probably. Thank you for continuing to run this alternate event even when you’ve made it to the real thing! My wife and I love this game! Thanks for the contest. This is one marvelous game! Can’t wait to add the promos to it. Thank you druid city games and GenCan’t. These look awesome! Love this game and everything Druid City Gamed has been working on! The artwork for this game is just astounding. The Druid City Games team really put a ton of effort into this one. Excited to be a part of Gen Can’t. Looks like a great game! Thanks for keeping us #GenCanters in your thoughts Druid City Games! The midsummer festival looks fun with all the dancing going on. Beautiful artwork! Yes! And then, the base game next! Oh man this game is great! This is a great game. Thanks, Druid City Games, for donating the promos. Those look awesome! Thanks for the contest! Sounds like fun. Thanks for the opportunity! This would force me to buy the game as well. Ah! I finally found this! I love Grimm Forest and am so thankful @DruidCityGames thought of the rest of us! Yay! More content for Grimm Forest. Thanks Druid City Games!!! Colorful & beautiful artwork always catches my eye and causes me to take notice. This artwork heralds back to a different time and is refreshing! Thanks James and DruidCity for keeping us #GenCant ers in the loop! I darn near missed the secret card in the box, I hope I dont miss these! Aw, James is such a nice guy! Promos look great! I’m painting The Big Bad Wolf for the mini contest. I would love these promos! Awesome opportunity to potentially score some sweet Grimm Forest promos! Thanks Druid City! Awesome opportunity to potentially score some great-looking promos for Grimm Forest! Thanks James and Druid City Games! James, you are a gentleman and a scholar! Druid City Druid City let me win! I’d love to get these cards and show them to my friends! Love this gorgeous and adorable artwork! This looks like fun. Thanks for giving the chance at promos to those of us who can’t afford the travel. Druid City Gonna be huge! Love what they are doing! Oooh! Beautiful. I would love to win these cards, especially since our kids love to play The Grimm Forest with us! Good luck to everyone! These cards are incredibly cute! Would be a great addition to our Grimm Forest collection! This is my first time reviewing the GenCant site. I was fortunate enough to be one of the Kickstarter backers for Grimm Forest. Commenting to be eligible for a giveaway for a fun game that I own is a great way to start – thanks! I love this game!!! It’s the go to whenever I get together with my friends. Would be great to have a couple more cards to use. Would love an expansion set with new fable and friend cards as well. Hint hint. I love this game. We get very competitive about it. It would be awesome to have some new cards to use! I’d love to win. Good luck everyone! What is this game similar and to and how do you play? I see a lot of comments and am interested in the promos, but I am new to this and would love to hear more about this game. Suzanne, does Dice Tower have anything about this online? Sweet! Love me some Grimm! Don’t have the game (*cough cough*) yet, but the art is fantastic!! I’m welling up a bit that James remembered the GenCant Brigade, what a dude. Love my copy of this game. Cheers! Grimm Forest is a great game. Love the art work! My game group loves this game. Thanks for the reminder to pack it for our day long GenCant tomorrow. Also thanks to James for remembering those of us not in Indy. Amazing Game! The art is Beautiful! Those look great! Thank you Druid City Games! Awesome artwork! I’ll have to look for this at my FLGS. Thanks for the donation and chance to win. Thank you, Druid City for both giving away such a beautiful promo, and for not forgetting up GenCanters! One of my favorite games this year. The whole family loves it. Hope I win a set of these. Love the game! Such a great game! Thanks for including us! Wow that is wicked cool of them! Artwork looks amazing – kudos to the artist! Thanks in advance Druid City Games! This is a great game. Would love these promo cards. I have Grimm Forest on the table ready to play tonight when some family come and stay over. Looking forward to it! These are super cool. Would love to get a set to add to the game. Thanks Druid City Games! Wow, druid city is moving like jagger. Nice. I want those cards! Grimm Forest shows an awesome production work. My best kickstarter experience so far. A great game. And it’s fun to play! My kids and I love this game! Painted this game and love it. Green Forest is awesome! Thanks, Druid City! Thank you James! Maybe new cards will motivate me to finish painting this. Those are two really good cards! Especially No Permit. Best game purchase ever. As soon as one of my group played this at work, he immediately bought his own copy. Sneaky awesome game. We would love to have some new additions. Good luck everyone! Took awhile to scroll al the way down here! Thanks James – more fun for a fun-packed game! 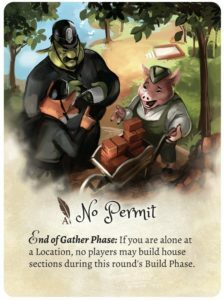 Wow, no permit is harsh, would really affect the late game. Love it! Interested in picking this up. Wow the artwork is amazing! I’d love to add these promos to my copy of The Grimm Forest. Thanks for the giveaway! These promos look awesome! That’s great of them to do, the art on this game is amazing. Will enjoy playing this game!! Thanks for all the prize support! You guys are the greatest. Hoping for some promos. Grimm Forest is my 8-year-old son’s favourite game. And he beat me at it on our first game! Would love to have the promos. Keep up the good job! Thanks for remembering us Druid City Games! I can’t wait to get Grimm Forest and paint it up. I would love some promos to get even more out of the game! Great game. Thanks for the chinny chin chance of getting one of these. Who doesn’t love a promo? I’d love to win a set of these! No Permit sounds like it’d be a fun one to play with. I love the art in this game. Would love to get these promos! Love the art and theme of the game! I’m looking forward to trying the game, would also love to add the promos! Thanks for offering the promos! Wahoo! Thanks for the giveaway! Thank you for offering these promos! I really want to win this card, because i loved the game and i need everything for this game. I LOVE THIS GAME AND WANNA WIN THIS TO PLAY WITH MY KID. PLEASE, LUCK, STAY WITH ME. This is the best game that i have ever played in my life. Is beautiful, full of references and funny to play with anyone. I’d like a chance to win these promos. That is awesome! Great game and great company!